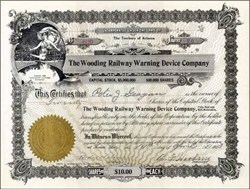 Beautifully engraved certificate from the Wooding Railway Warning Device issued in 1913. 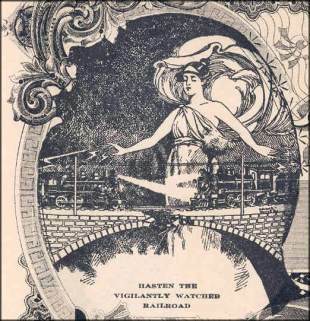 This historic document has an ornate border around it with a vignette of a woman looking down on two trains coming at each other with the words "Hasten the Vigilantly Watched Railway". This item is hand signed by the Company�s President and Secretary and is over 89 years old. VF Condition.